So... You are going to speak at an AA meeting? FOREWORD -- This leaflet has been prepared by members of the Friday Forum Luncheon Club, an Akron organization that warmly welcomes all AA's to meet with it for luncheon and fellowship every Friday, 12 noon, at the Mayflower Hotel. The suggestions found in this leaflet are just that -- suggestions. It is hoped that they may be of value to all speakers, regardless of their AA age. Its prime purpose however, is to aid the man (or woman, for the masculine pronoun is used for simplification) who is confronted with giving his maiden talk before an AA group. The thoughts expressed are the thoughts of a score of AA's, mostly veterans of a year or more experience. The editors wish to point out, however, that the suggestions made here are by no means Gospel, or in any way infallible. Your talk deserves the best effort you can put into it. Anything having to do with sobriety deserves nothing but the best. You can avoid the embarrassment of stumbling around groping for words and ideas if you will use the forethought of preparation. This does not mean sit down and write out a speech. But organize your subject matter beforehand. If you have any doubts as to your memory -- and remember, you may experience stage fright -- prepare written notes. After preparing them, follow them closely or you may get off on a tangent, find yourself in a thicket of verbiage, and have difficulty in finding your way back into your notes. Remember, you owe your audience some consideration. To speak before a group with no preparation is an insult to their intelligence. There is a saying among modern clergymen: "No souls are saved after the first twenty minutes." The two-hour, yes, even the one-hour sermon is a thing of the past. 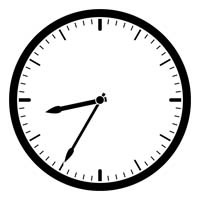 In almost all cases effectiveness is lost after thirty minutes. After the first half hour the average listener starts to wonder when the speaker will come to a climax and stop talking. His mind wanders, and what good the leader has done in his first half an hour immediately becomes undone. The longer he continues to talk, the less his listener will remember when it is all over. Remember, alcoholics are restless people. They squirmed at sermons, twitched at movies, avoided long plays and concerts, almost never attended lectures. Demosthenes’ himself could not hold an alcoholic audience for more than half an hour. Don't flatter yourself by thinking you can. If you don't own a watch, borrow one and keep an eagle eye on it. When your half hour is running out, come to a speedy conclusion. Your audience will be profoundly grateful. Lincoln's Gettysburg address lasted four minutes. The principle speaker of the day, Edward Everett, talked for two hours. No one but a professional historian today knows what Everett said. Every school child can give Lincoln's talk verbatim. Speak up. Don't Mumble. Trained orators in the days before public address systems developed a hard and fast rule: Talk to someone -- a friend if possible -- in the very back row of the auditorium. Then you will be sure everyone in the hall will hear you. And take your time. If you speak deliberately you may not crowd as many words into thirty minutes, but at least they will be understood. Your audience knows you are an alcoholic and a member of Alcoholics Anonymous. 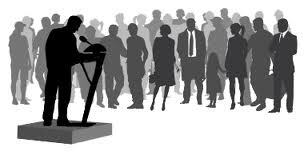 Your presence on the platform is proof of that -- except in a few rare occasions where the speaker may be a non-alcoholic, and will be introduced as such. Consequently it is ridiculous to "qualify" yourself. It may be necessary to give some of your drinking history to illustrate what obstacles you had to overcome to become a practicing AA. But keep it to a bare minimum. Avoid as you would the plague a blow-by-blow account of your drinking days and experiences. There are probably a dozen persons or more in the audience who can give you cards and spades on drinking background. A recitation of drinking experiences has a definite place in the AA program. It establishes a bond between the AA and the man who may someday be a member. It helps convince the new man that he is not the only one in the world who has a problem. So your drinking story is valuable when you call on the prospect in his home, in jail, or in a hospital. But at a meeting the audience is more interested in WHAT YOU HAVE DONE TO KEEP SOBER. Draw on your drinking experiences to illustrate points and make an end of it. "HOW I KEEP SOBER" should be the topic of EVERY AA leader. Don't try to cover everything you know in one talk. You probably will be invited to lead at some future date. Try to use as much new material as possible in each talk. The man who heard you Monday night might hear you again on Thursday. No one knows all the answers. Don't give the impression that you are an exception to this rule. Don't read lengthy poems or quotations of any kind. They are boresome. If you must quote, be brief. Don't criticize. Leave that for your fifth anniversary. And when your fifth anniversary comes, don't criticize. Don't be dramatic or play to the grandstand. Don't get involved in circuitous analogies. Someone has already built the ladder or constructed the house -- probably better than you can. Don't be too positive. Rather, have strong suspicions. Many a man who "is never going to take another drink" on Tuesday night is plastered as a new house Wednesday morning. Don't feel you must have a weighty answer to every comment from the floor. If you have no simple comment, a "thank you" will handle the situation. Advising against over eulogizing you, the speaker (you are a modest lad) If you are your own chairman, suppose you do that -- as tactfully as possible. Thank each speaker, no matter what he or she says. Encourage the new and inexperienced always. Avoid lengthy comment as the plague. You will find new trains of thought are a labyrinth from which you cannot easily escape. Temptation to reminiscence will impede you and after all YOU HAVE SPOKEN YOUR PIECE. Give the audience a chance. Keep your eye on your watch. Close on time with courteous acknowledgements to the chairman, the members who have spoken and the group generally, going from there to THE LORD'S PRAYER.